Book Description: Rick Blaisdell's new book exists for those who are sincerely looking for hope and purpose in their lives. It is a living testimony of what God can do with a life given to Him in faith. The author's experiences prove that God opens the door, and makes the seemingly impossible, possible. In addition to the detailed journal entries, which provide vivid details of Rick's mission trips, the book is comprised of original color photos, maps, countless testimonies of salvation, transformation, miracles and signs, and more. 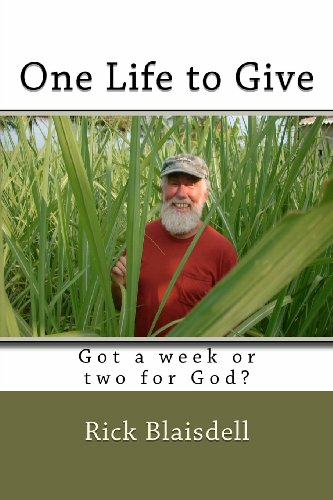 I had the privilege of reading the first edition of Rick Blaisdell’s, One Life to Give, several months ago. My enthusiasm was engaged right away by Michelle L.’s forward note and testimony, and Rick’s recounting of his early years in the preface, provided powerful evidence of the power of God to transform lives. I will say, and other readers might experience this also, that after reading through the chronicles of the first several mission trips to Eastern Europe, Africa, South India, and the Philippines, that my enthusiasm began to flag a bit (not for his work but for the actual reading of the book). However, at this point I found myself being swept up in the enormity of what was being accomplished on these mission trips. He and his team have been harvesting countless precious souls for eternity. And most of those reached have been existing in lifelong conditions of abject poverty, hunger, inadequate shelter and clothing, often terrible , unimaginable abuse, and certainly fear and hopelessness. Imagine what the message of the Gospel means to them! Ultimately this is not a book about Rick Blaisdell, but rather a testament to what God can do through a humble man of giant and unwavering faith, even now in the 21st century. It is a reminder that the only limitations on God’s power in the world are those WE place on Him. I highly recommend this book. The expanded and updated edition is wonderful. The improvements made in the rewriting of this novel were remarkable. I think the new book now captures the reality of it all and how the author becomes who God wants him to be. I could feel the experiences and appreciated the history of the journey. Everything seemed to jump out in detail and is an excellent rewrite to an already awesome book. I was captured by Rick’s testimony of his life before he received Jesus Christ into his heart and the immediate, supernatural transformation of Rick’s life and his purpose for living. May you quickly discern from Rick’s testimony, the singularity of Jesus Christ and His all-encompassing, all powerful, all encouraging, eternal love towards and for us. It is this love, the love of Jesus Christ, which leads Rick into ministry, first at home then locally. When the doors of international ministry opened, Rick responds with a heart filled with thanksgiving, obedience and a desire to be used by the Lord. 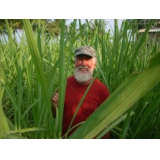 May you discern, through Rick’s journal like style of writing, that mission’s work is not an act of work. It is not about putting on another “hat” or changing one’s character to do something different, but missions is responding to God’s expression of unchanging love through a willing vessel. This book is not about the act nor the logistics of mission’s work, this is not about the “number” of people that Rick ministered to. It is about the “One” he ministered to. Each chapter retelling of supernatural events, healings, and deliverances will serve to encourage you in your walk with Jesus and in the ministry field he has equipped you to operate. Rick shows so much clarity in his walk with God. This is what I feel and hear from this wonderful book. We can only hope to receive healing and be able to pass it on to others. It welcomes you with open arms and lets you come as you are, broken or whole. Let us believe in the faith that Jesus Christ teaches us in the bible, as Rick has shown us by example in his own life. Through the power of prayer, I was healed from a critical illness. Because of a miracle in my own life, I have been born again. We are all in need of some good news…this book is the good news. Read and rejoice. Psalm 63:7 says, “Because you have been my help, therefore in the shadows of your wings, I will rejoice”. Honest book, journey of the true pilgrimage! Original report of faith that works by love! Galatians 5:6.